I’ve begun to start transcribing a lot of the documents that I have collected over the years. 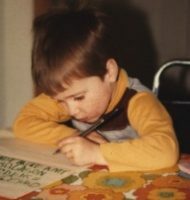 I’m starting on the letters that my grandfather, LeRoy Thielke, wrote home during World War II. The first letter I grabbed was the one he wrote to his mother when he was being shipped off to Europe. It’s heartbreaking and courageous to see him write that. I can’t imagine what he was feeling at the time. 24 April 1944 – Monday – 9:00 A.M. It was a lot better that way because we didn’t have to transfer at North Chicago Junction. We had a mixed crew aboard. Waves, Wacs, Sailors, Marines, and of course Soldiers. Well Mom, I got my wish. I’m pulling out in a few hours, 11:45 A.M. to be exact. According to the things we have to carry in our personal duffle bags, I think we’re going for a long ride. We’re going on a troop train so I don’t suppose I’ll be able to write again until I arrive at the place we get off. There’s only one other kid leaving with me from our barracks, that is we’re leaving on the same car together, so we should end up at the same place. I’ve been talking to him and he’s a high school graduate too, so we both think we will get into something better than the infantry, we hope. I’d like to get into something that I can make a profession or career out of. Mom, I’ll write as soon as I can and let you know where I am and also if I want my car jack up. Don would probably do it for me. Well Mom, Good Bye Now. You can write to me at the address on the envelope. I’ll get it. On a side note. I updated, what I’m going to call, my Notes site. This is basically a wiki where I will post a lot of transcribed stuff since it’s a better spot to hold that kind of information. There are a few interesting things already on there. The thirty-fifth ancestor in my 52-week challenge is my wife’s maternal 4th-great-grandfather, Lyman Eugene WHIPPLE. According to the information we have, he was born in about 1816 in Smyrna, Chenango, New York to William Walton & Rosina Whipple. Sometime, probably in Ohio in the late 1830s, he married Cheney Mariah HEATH. My wife’s ancestor, Nancy Whipple, was born about 1849 in Ohio. According to his bio, he entered military service August 13, 1862 in Berlin, Wisconsin into the Union Army Company C, 32nd Infantry Regiment during the Civil War. His first wife, Mariah, passed away in 1864 in Wisconsin. He later married a woman named Catherine and moved to Minnesota. He passed away in Cass County, Minnesota in July 1894 and is buried there. This post is 35 of 52 in the “52 Ancestors in 52 Weeks” Challenge” begun by Amy Johnson Crow. Hawaii (or Hawai’i) is the next state on my Genealogy of the States series. I have no direct ancestors that were born in the state, but my connection to it is that my grandfather, Richard Zalewski, was stationed there for many years during World War II. 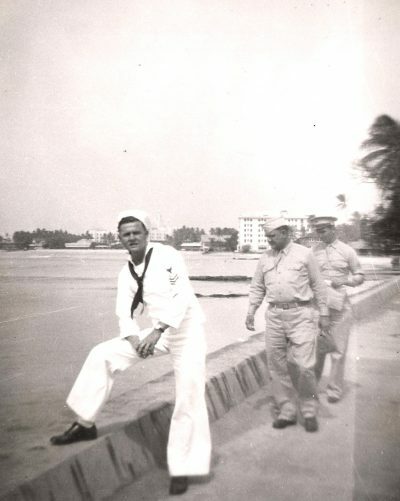 He spent most of his time in Hilo, on the island of Hawai’i stationed there with the US Navy. From the looks of it, he did a lot of mechanical stuff with the Navy’s airplanes. He also did a bit of work with the US Coast Guard and he was at Hilo during the 1946 Hilo Tsunami caused by an earthquake in the Aleutian Islands. I have a copy of an article from April 2, 1946 talking about the US Navy rescuing some men who were lost out at sea due to the Tsunami. Along with the stories, I have a collection of dozens of photos he took during his time in Hilo. Most of them are even labeled with the names of the men in the photos. I have put them up on Flickr, among other places, hoping to possibly get copies of the photos to the families of the men in the photos. Not a lot of luck, yet. The fourth ancestor on the 52 Week Ancestor challenge was picked using my patented ancestor-o-matic. It’s really just a random number generator and then using that number on my daughter’s ahnentafel chart. This week is William J DAKINS. William is my wife’s 3rd-great-grandfather on her maternal side. His obituary in the Stevens Point Daily Journal from Stevens Point, Wisconsin says that he was born 29 April 1846 in Toronto, Ontario, Canada. This matches up with his census records that indicate he was born in Canada. It looks like his family, including father Amos DAKINS and mother Phoeba C (RILEY) DAKINS, moved from Canada to Wisconsin early in his life as they are found in the Fond du Lac, Wisconsin area in the 1850 US Census. In 1860, the family is found further north in Waupaca County, Wisconsin, though close to where William would settle later in life, in Weyauwega. On 14 December 1864, William did what a lot of other young men in the country did that year, he enlisted to join the Civil War. He was stationed with Company I in the 17th Wisconsin Infantry. 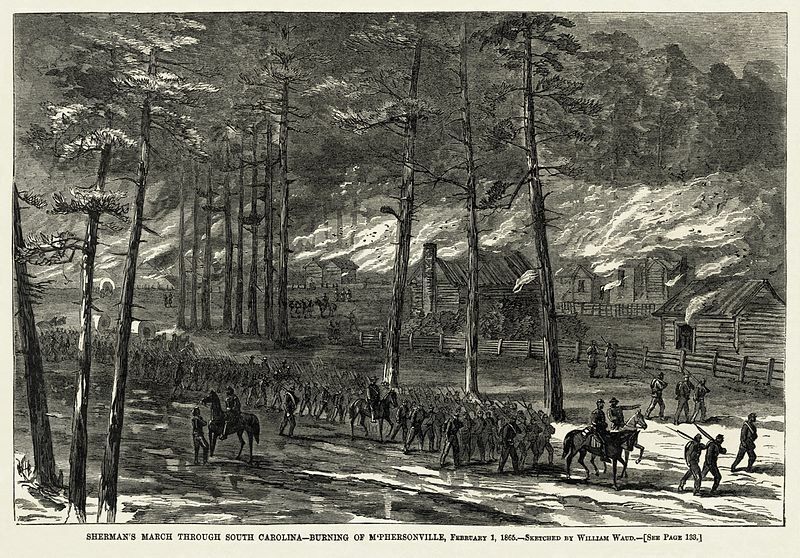 At the time of William’s enlistment, the 17th Infantry was involved in the Carolinas Campaign. 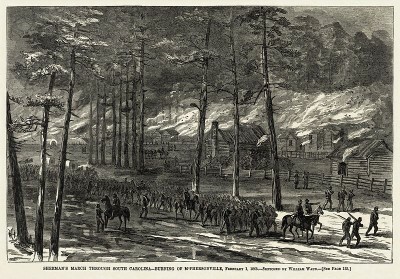 In January 1865, Union Maj. Gen. William Tecumseh Sherman advanced north from Savannah, Georgia, through the Carolinas, with the intention of linking up with Union forces in Virginia. The defeat of Confederate Gen. Joseph E. Johnston’s army at the Battle of Bentonville in March, and its surrender in April, represented the loss of the final major army of the Confederacy. The obituary also states that he was involved in the famous Sherman’s March to the Sea, but that looks to have taken place right when William was enlisting, so I’m not sure if he was. After William returned from war, he married Helen Marion WARNER on 4 October 1871 and they settled on a farm in Plover, Portage, Wisconsin. Together, they had 6 children, including my wife’s ancestor, Mary DAKINS. They lived in Plover until William’s death on 18 April 1916. The obituary says he was ill with heart and stomach problems. He is buried nearby in the Plover Cemetery. This post is 4 of 52 in the “52 Ancestors in 52 Weeks” Challenge” begun by Amy Johnson Crow. Public domain photo courtesy of Wikipedia. 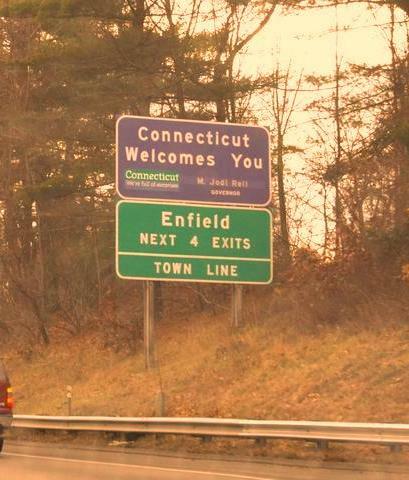 Connecticut is another state that is mainly from my wife’s line, specifically her maternal line which dabbles a bit in Colonial America. The most recent ancestor to appear in Connecticut is her 4th-great-grandmother, Susan (SKINNER) WARNER, who is noted to have been born in the state in about 1813. There isn’t much more info about Susan that I have on file. This is also where her documented mtDNA line stops as Susan is a direct maternal (mother’s mother’s mother, etc) ancestor of my wife. Many of the other Connecticut ancestors are actually ancestors of Susan’s husband, Seth WARNER. Seth’s grandfather, and my wife’s 6th-great-grandfather, Phineas RIPLEY, was born in Windham, Connecticut on 20 March 1746. This information was taken both from a Sons of the American Revolution Membership Application and a Find-a-Grave entry, so there is more solid research to be done. Phineas Ripley was also involved in the Revolutionary War with Herrick’s Regiment Vermont Militia according to his service record from Fold3. All research to the present time indicates that Thomas Bingham of Connecticut and his mother, Anne Fenton Bingham, were the earliest Binghams to settle in the North American colonies. They migrated to Saybrook, Connecticut Colony from Sheffield, Yorkshire, England between 1652 and 1659 when Thomas, who was born in 1642, was ten to seventeen years old. Another surname that makes some stops in Connecticut on my wife’s line is her WHIPPLE line. The most recent one being Thomas WHIPPLE, Sr. who was born in Somers, Toland, Connecticut on 23 October 1760 and is listed in the Connecticut Town Birth Records from the Barbour Collection. It continues on to Thomas’ father, Nathan WHIPPLE who was born and married in Somers. Nathan’s parents, Thomas & Mary (GARY) WHIPPLE both married and died in Connecticut and his mother was born in Woodstock, Windham, Connecticut in 1699. Our currently documented line stops there for us on the Whipples. So far, those are the only connections to Connecticut. Public domain photo from Wikimedia. Over the last few months I’ve put together a lot more information about what my grandfather did in World War II. As previous posts mention, he never really talked about the war, not even to my mom. Though, he has kept a lot of items from the war and I guess he was starting to put together a map before he started to have health issues. Sadly, my grandfather passed away on November 1, 2015. I did not get any more time to talk to him about his time in the war, but I’ll never stop researching his service to my country. Outside of that, I’ve put together a rough history based on letters, notes, photos, and maps that he kept along with some tricky Google searches and Wikipedia. I am posting this for both posterity and to maybe get some searches coming this way to open up more history from other researchers. This will be an ongoing post as I find and update the information, but I want to get it posted. There is an updates section at the end of the post where I will note what I updated or edited. I have also recently put this information into a Google Map since they have released the custom map engine for their new map system. A couple of weeks ago I finally got a bunch of photos from my maternal side of the family. I really had next to nothing when it came to photos for that side of the family compared to the amount from my paternal side. Among the awesome pics of my grandparents and their families when they were younger, there are some photos of my grandfather during World War II. You may have remembered that there is almost nothing known about his time in WWII. It’s not something he talked about with most people and he’s considered too “young” to show up in a lot of the available public military records. I have yet to go to the state military archives, since there may be some stuff there, too. 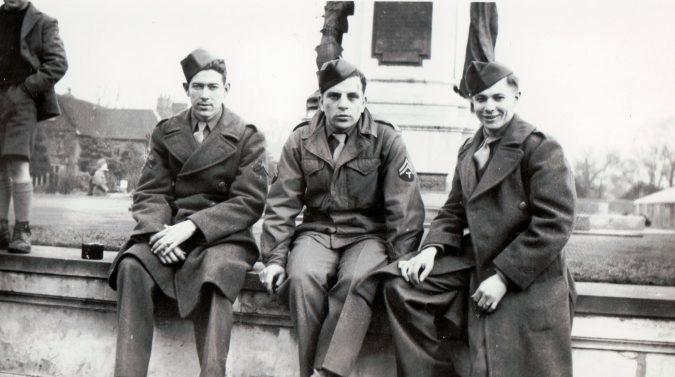 One amazing photo was of him and a group of other men from November 1945 in Mannheim, Germany. The building behind the group has the words “504 QM BN Headquarters” on it. I quickly translated that to the “504th Quartermasters Battalion.” As much searching as I did, I could not find any info on that specific battalion. I posted a query over on /r/Military on reddit and got some help, but nothing solid. Fortunately, on the back of the photo were the names of all of the men. I searched for all of them and didn’t find much besides some generic obituaries, but again, no solid info. Click for larger. My grandfather is 2nd from the left in the 2nd row. My mom brought over another photo album and some newspaper clippings. One of the clippings was from a local paper in 1944 talking about my grandfather, a local man, and his service information. This clipping lists him as being part of the “748th F. A. Bn. Hq. Btry.” out of Camp Shelby, Mississippi which I assume is the “748th Field Artillery Battalion Headquarters Battery.” Again, no solid leads on that information, but it is another avenue of research. The research trail continues. I may have some time to sit down with my grandparents, though they are slowing down in their old age, and maybe ask him about his service. Rumor has it that he was working on getting all of his military info in one place before he needed heart surgery a few years ago. Maybe he’s waiting for someone to ask him now. I’d like to thank all of our ancestral military veterans in our family trees. Thanks for fighting for this country in any way you could, be it fighting in combat, fixing machinery, or defending our borders. Thanks for helping fight to allow me things like freedom of speech and the right to vote. Here is a (hopefully full) list of all of our veteran ancestors. William J DAKINS – My wife’s 3rd-great-grandfather – His obituary states that he served in the Civil War with the 17th Wisconsin Infantry and was with Sherman on his famous march to the sea. Johann LAST – My 3rd-great-grandfather – My research tells me that he served in the Civil War with the 50th Wisconsin Infantry. It seems he was stationed in what was the Dakota Territory at the time to protect the western front. Jesse TONEY – My wife’s 3rd-great-grandfather and Carey’s grandson – Served in the Civil War as Corporal in Company G 33rd Wisconsin Infantry. 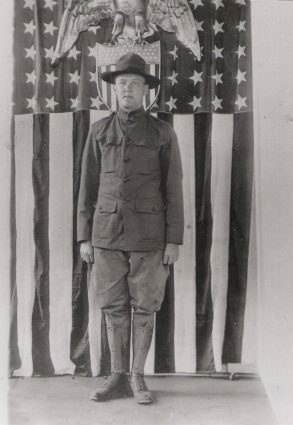 Joseph ZALEWSKI – My great-grandfather – Served in World War I with the 86th Division, Company B, 331st Machine Gun Battalion. That division was split apart into other divisions. I wrote a post about my findings. I have not found information on where he went after the split, but stories say he fought in combat in France near the end of the war. Richard ZALEWSKI – My grandfather and Joseph’s son – Served in World War II, though didn’t see any combat. 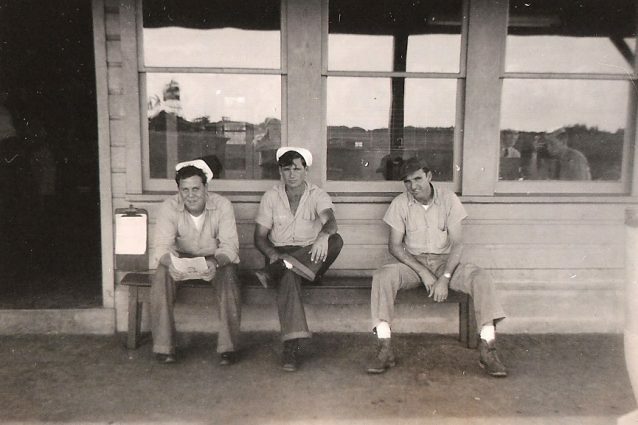 He was stationed with the US Navy in Hilo, Hawaii as an Aviation Machinist’s Mate. 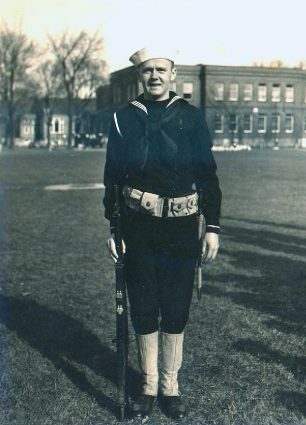 Keith MORAN – My wife’s grandfather – Served in World War II. No documented information on his experience, but my father-in-law says he was involved in some combat in the colder areas of Europe, probably around the Belgium area. 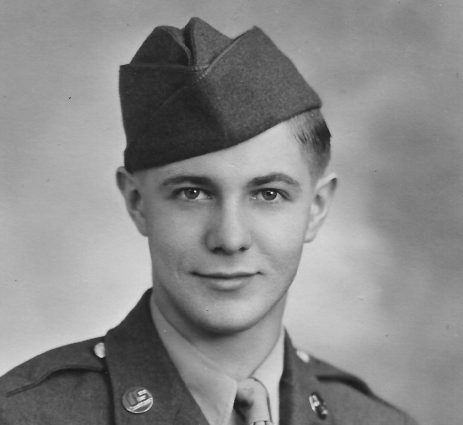 LeRoy THIELKE – My grandfather – Served in World War II – I have recently posted a large amount of information from his experience in WWII. Though, he’s not the one who likes to talk about it. Hopefully, I can find more information to honor his service. I may have possibly missed a few individuals. I think there were more Civil War veterans, but it’s tough to search my information for that. In any case, today is the day to honor them, though we should always honor their sacrifices for our freedom.